UK consists of 4 countries, England, Wales, Northern Ireland and Scotland. The size of Scotland is about the size of Hokkaido Island in Japan. 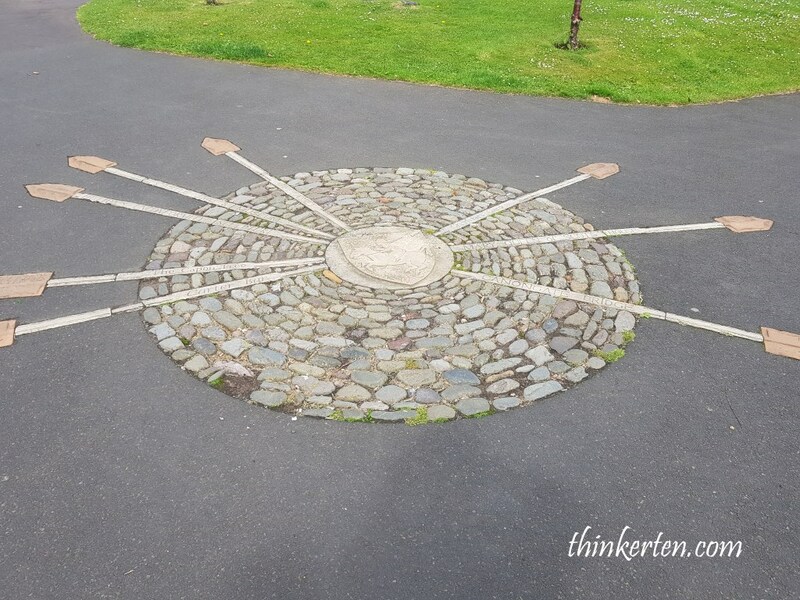 It is located the northern part of UK. Alexander Graham Bell, the great inventor who is actually a native Scottish, invented telephone who immigrated to North America. And if you like Golf, this is the motherland and birth place of Golf. Yes, 18 holes Golf was first invented in this highlands. The advantages of self driving when you travel is you can stop anywhere you want to. 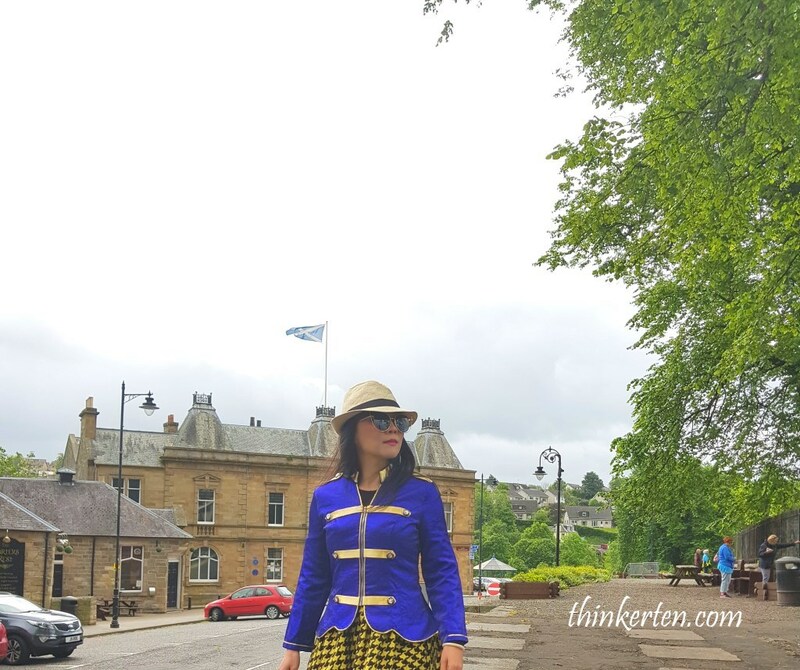 There were few impromptu stops during our UK self drive and the first one we tried out was to Jedburgh in Scotland, a small town which is 10 miles away from England border. 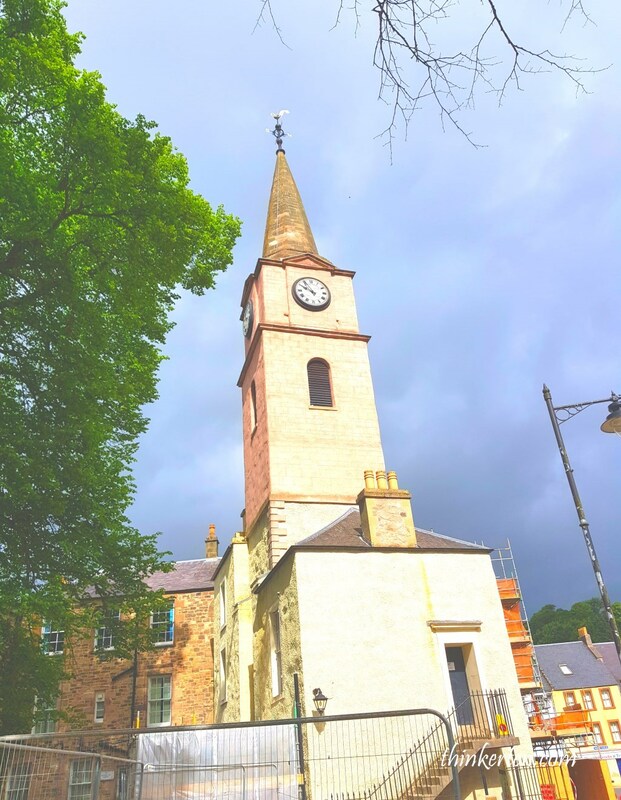 We didn’t know what we would expect as going to Jedburgh was not in our planned itinerary. And we have not done any research on Jedburgh. 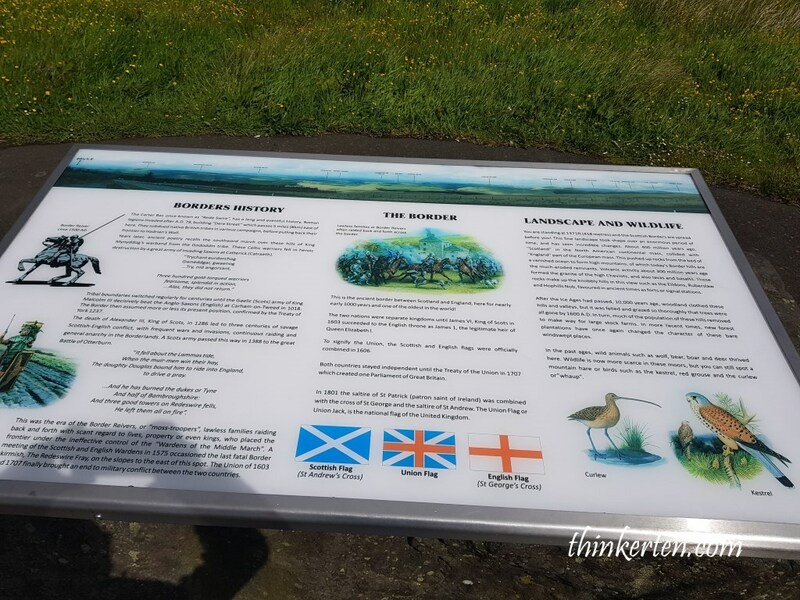 We saw a signboard showing “tourist spot – Jedburgh” with a castle/abbey looking picture on it, without a second thought, we just act spontaneously and exit the lane and follow the way to Jedburgh. Sometime going out of the bounds could be thrilled and fun. 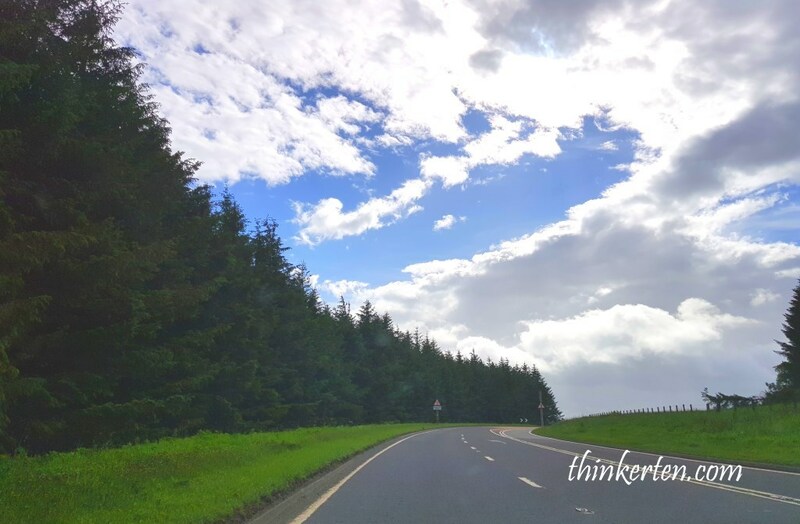 Some pictures on the highway of Scotland, blue sky & green grass make a perfect picture. We were blessed with beautiful weather. 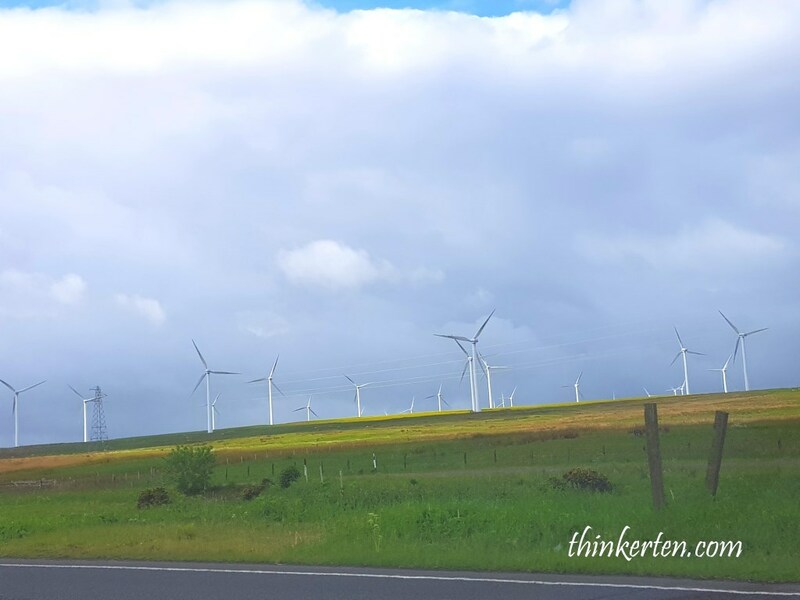 Passed by a a wind turbines farm in Scotland, found them quite pretty and the turbines are moving very fast as the winds are super strong. 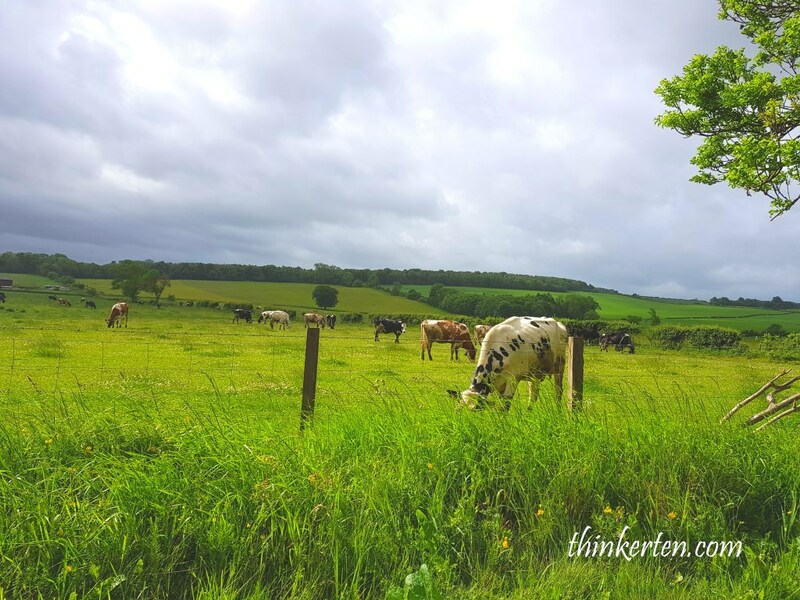 Cattle enjoying on the pasture in Scotland. Picture was taken during the drive. We drove for extra half an hour after exit the main highway, then reached the tourist spot in Jedburgh. We were so glad to see the old stunning ruin in front of us. We quickly parked our car, with no hassle as there were plenty of car park lots. 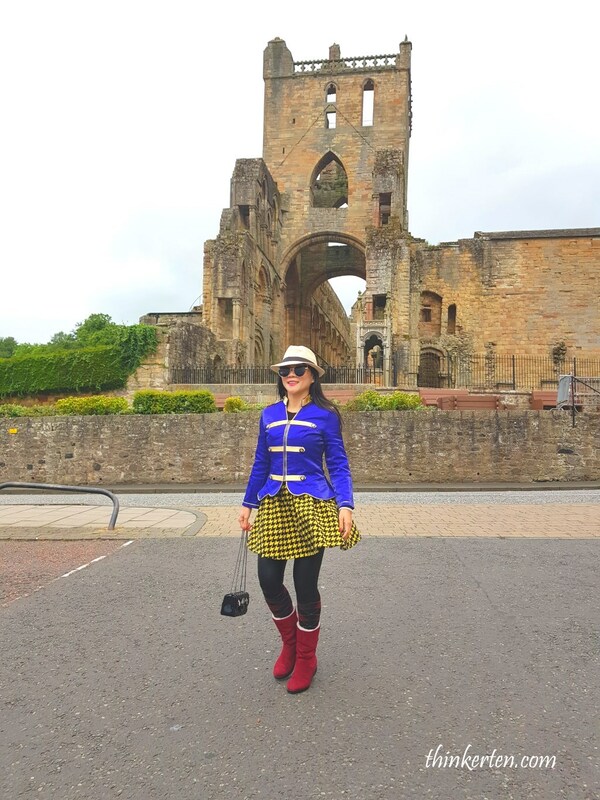 There are many thing I love about traveling in UK and one of the most important thing is the beauty and history found everywhere. 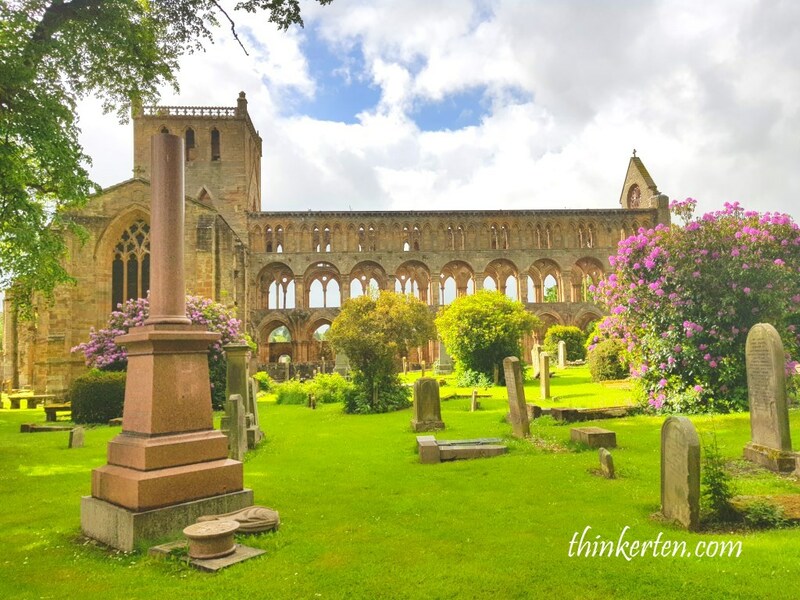 Even in this little small town of Jedburgh, you get to see such beautiful Abbey. The 12th century Abbey features some of the finest Romanesque and Gothic architecture in Scotland. I took some picture ( refer to below ) of the houses near the stunning Abbey. It was a Sunday morning, very quiet and most shops were closed. 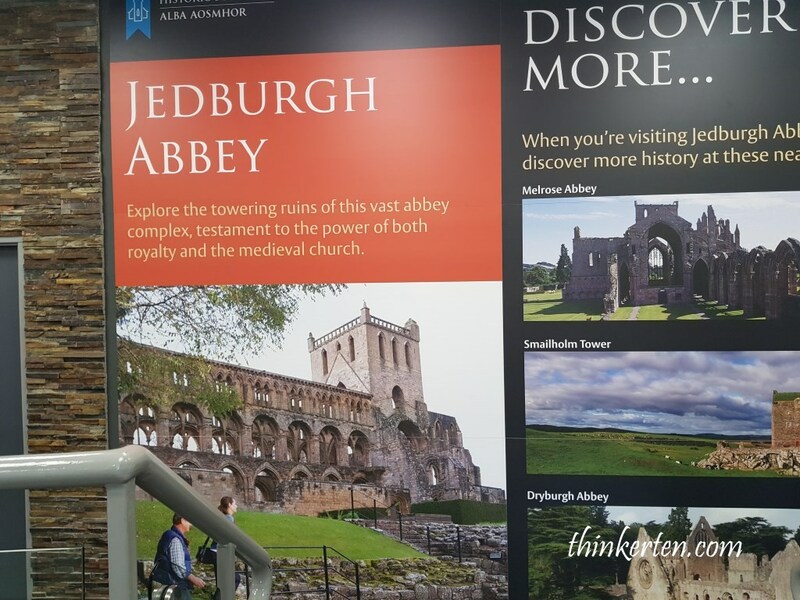 There is a lovely visitor center and clean washroom near the Jedburgh Abbey, go in and have a look and read about the history and take a break. There is also a box of period costumes for children to enjoy dressing up 🙂 You can also purchase some souvenirs from there. If you have enough time, you can follow the trail and do some hiking. I saw a small group of retired people doing the hike together. 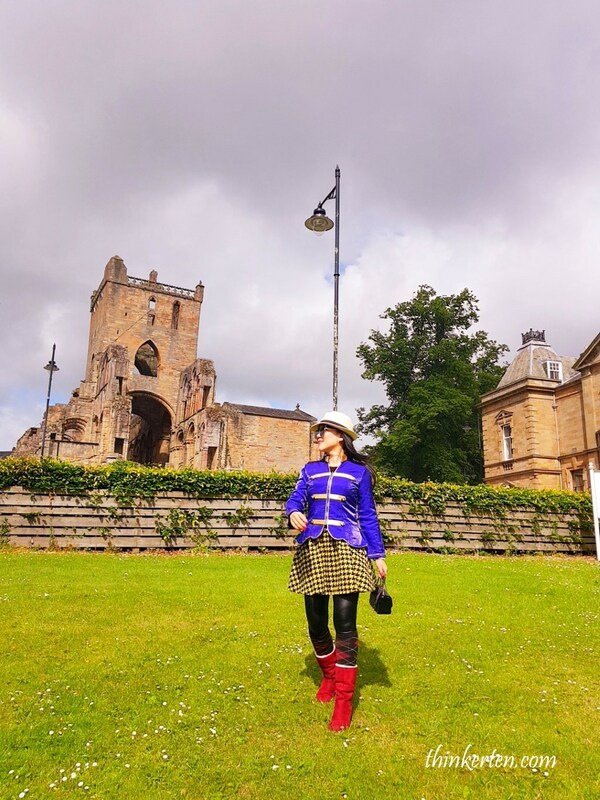 Sitting at the border between Scotland and England has it downside, Jedburgh Abbey was partly destroyed because of the fight between these two borders in the early days. The damages has been repaired and restored after several fights. 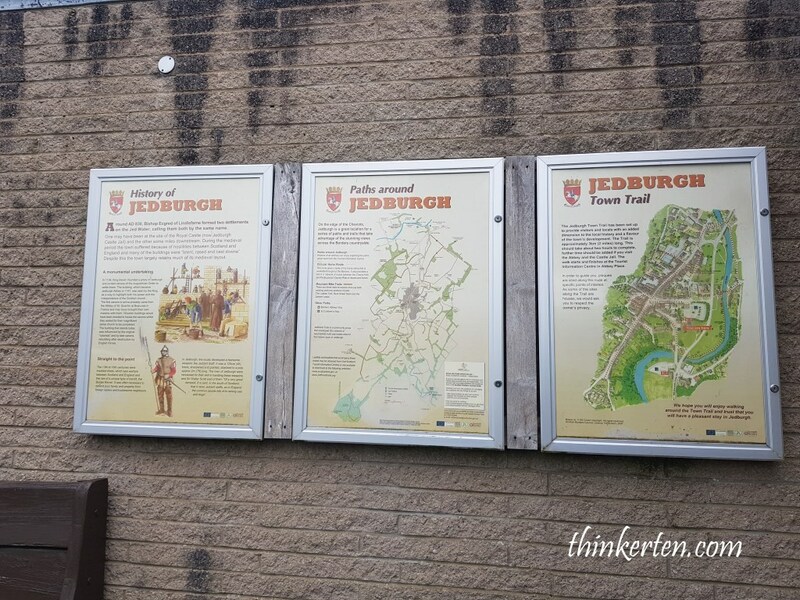 Road map showing places of interests in Jedburgh. You can also explore Jedburgh Castle which is only 0.3 miles from Jedburgh Abbey. Car park here is free of charge. I am glad we have made this impromptu visit and found this gem. 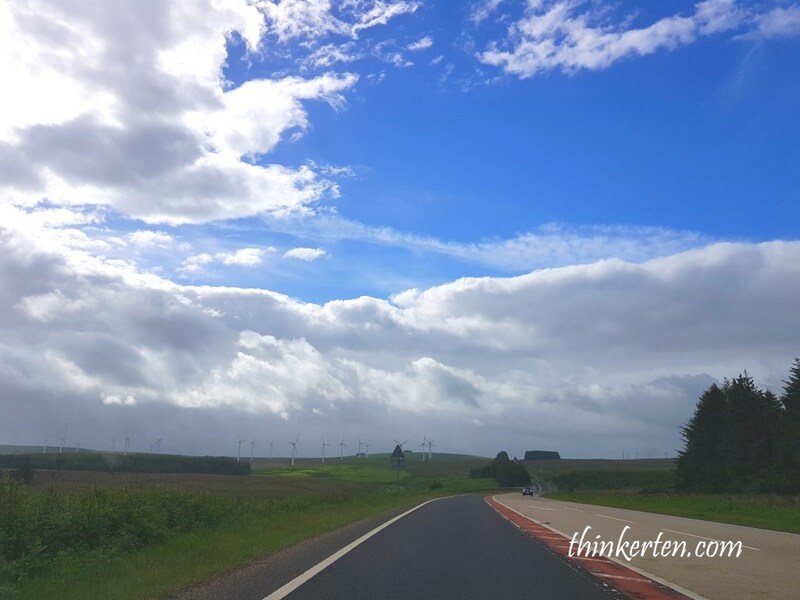 We drove away from Jedburgh and went into the highway again. We noticed the scenery of the highland is really amazing and spotted a lookout area so we immediately drove in. The serene landscape is between Scotland and England. 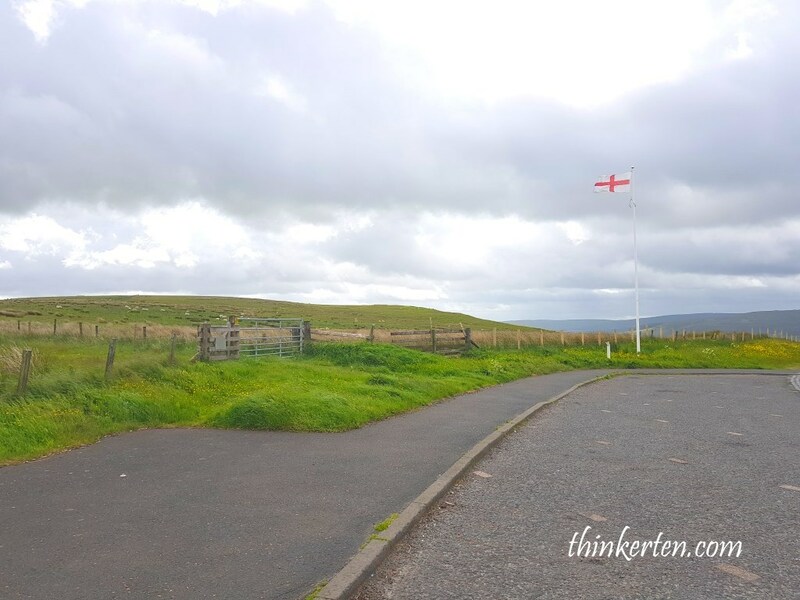 You can see the England Flag flying high on the sky at one side of the land. Do you know how UK flag is made up? The flag combines aspects of three older national flags: the red cross of England, the white saltire for Scotland and the red saltire of represent Northern Ireland. 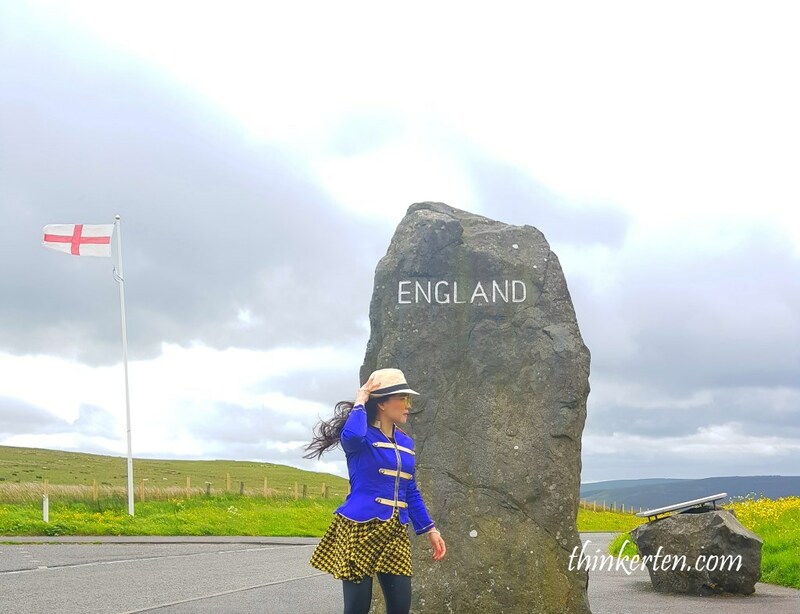 There is a big rock inscribed with “England” and the other side “Scotland”. Check out the how UK flag is form – refer to picture below. Consist of flags from these countries – England, Scotland and Northern Ireland and turn out to be pretty cool flag. 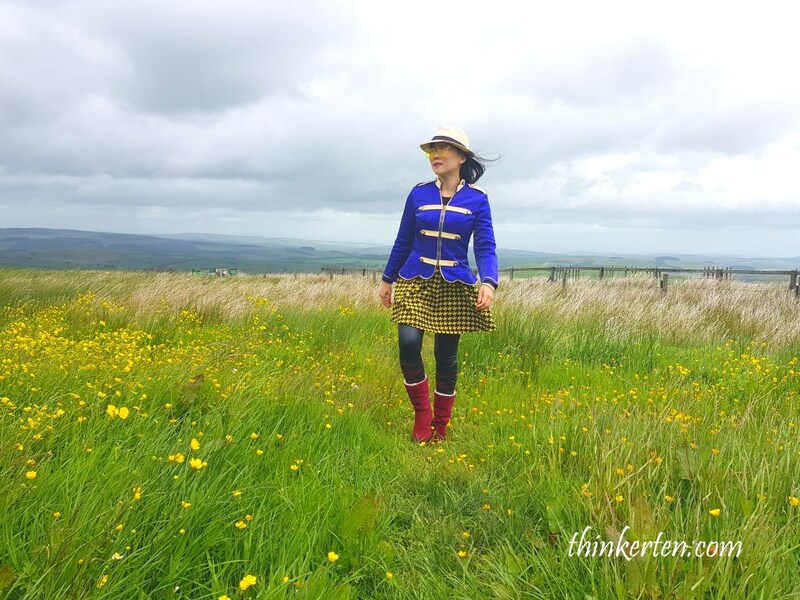 The Scottish Borders is an important piece of an often overlooked region. I am glad to have spent more time to discover on this part of the country as it is so steeped in history.